ADAARAN “Select” HUDHURAN FUSHI meaning “Island of White Gold” in local Maldivian language depicts the ambience of this island resort, situated in North Malé atoll. A natural lush green palm groves island blended with a variety of tropical fauna and flora. A truly Maldivian holiday spot with a huge turquoise blue lagoon and snowy white beaches, Hudhuran Fushi is the perfect getaway destination for the young and old, whether it’s for fun, tranquility or even romance. It truly resembles and oasis of white sand and lush green landscape. Hudhuranfushi earlier known as Lohifushi island resort is located in North Malé Atoll, 19 km from the airport. It only takes 30 minutes by speedboat and 1 hour 30 minutes by traditional motorized boat, the ‘dhoni’, to get to your dream destination. Within the walls of the villas you could find every amenity that you would require in order to make your vacation extra special. The king size beds, to your own bath tub add to the ambience of this cottage style room that beckons you to feel at home. Sandy pathways fill the areas in front of the Beach Villas leading right up to the edge of the shoreline, while the interior of the island compliments its lush green landscape. The Beach Villas of Hudhuran Fushi depicts a modern contemporary design featuring all the modern day amenities while the individual Water Bungalows, which features an elegant interior compliments it’s wooden and thatched exterior giving a discerning visitor a feeling of comfort and luxury. Every modern amenity is made available to all our valued guests so that you are never left wanting. Whether your need be food, recreation or just to sip a cooling beverage, every facility is made available at your beck and call the moment you walk in though our welcoming doors “¦ what’s more if you are a keep-fit-fanatic, a fully equipped modern styled gymnasium is available to all. Hudhuran Fushi pampers its guests with an irresistible choice of over four different types of Restaurants to indulge in the finest cuisines across the globe. 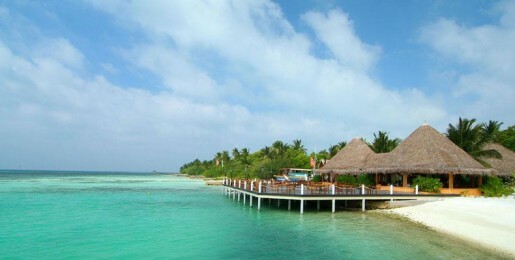 Furthermore Hudhuran Fushi serves up something for every moment with their choice of bars located throughout the Resort. Throughout our restaurants every possible culinary delight is made available so that our diverse communities of clients are always able to find a taste of home. For those who wish to feel the healing effects of nature, our qualified therapists are more than willing to pamper you with rejuvenating massages at our spas. But for those who wish to feel an adrenalin rush – the best advice to be offered is to head over to either our sports complex which comprises a fully equipped gym, badminton court, tennis court, football pitch and much more. The turquoise blue lagoon and the snowy white beach at Hudhuranfushi makes it just about perfect for anyone seeking fun and excitement via water sports such as wind surfing, catamaran sailing, water skiing, banana riding, canoeing, kite surfing to mention just a few available offers at Hudhuranfushi.